This is an impressive, altar-sized 13.9 oz botryoidal mound of glittering lepidolite in layers of botryoidal plates emanating from a phantom mica base! At the base you’ll see a bit of quartz and some albite to the side. She measures 3.6” by 2.2” by 1.2” and is a Brazilian beauty from Minas Gerais! I love the pink-violet color of her with the silvery luster that accentuates both her layers and slightly curved top. The sides are deeper in color and really display the stacked nature of her crystalline Spirit. Gleaming, glowing and heart-centered, she awaits her special Keeper. 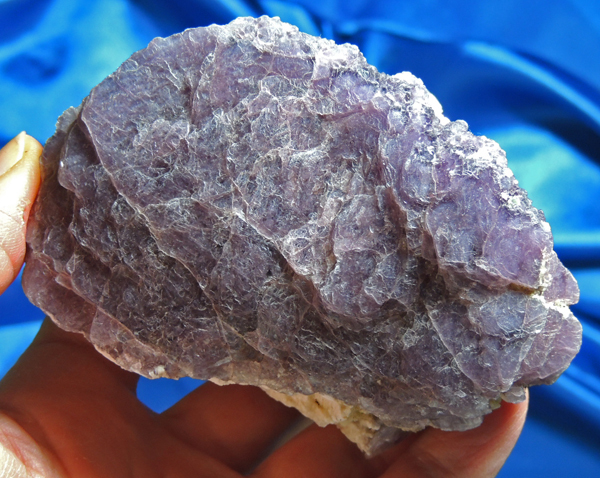 Lepidolite is a wonderful Spirit, lithium rich and vivid in coloration. She has incredible, mood-lifting energies that just seem to move you out of any funk you might be in. Mind you, it doesn’t happen in a hurry – it is a soft, and gentle process so that all of a sudden, you realize that you feel better – much better! Mica is awesome for introspection, adding an important element to her energies. She helps you understand the nature of the mood and assists in dealing with the root cause so as to banish it forever. She would love to be part of a crystal healing or Reiki practice where her nice size permits her to be placed comfortably on the body. She is just a gentle and energetic Spirit who complements many crystalline energies wonderfully!